I have been mostly gluten & dairy-free now for around 2 months now to help ease some of the digestive issues I've been having & I am really enjoying the benefits of the lifestyle. If there's one thing I've knocked, it's going gluten-free; but when I found out changing my lifestyle could actually help a lot of the issues I was having, I decided it was time to give it a chance. So how have I survived the past 2 months? By literally eating ALL the same foods as before, just in gluten-free versions!! I am going to do a longer post on being gluten & dairy-free soon, but I just want to make a point to say that I don't feel limited at all from this new lifestyle. My friends will tell you that I eat an extremely wide range of foods and I never miss out on any of my favorites. I still am not 100% strict and every once in a while I will have something with gluten, but I try to stay as on-track as possible. 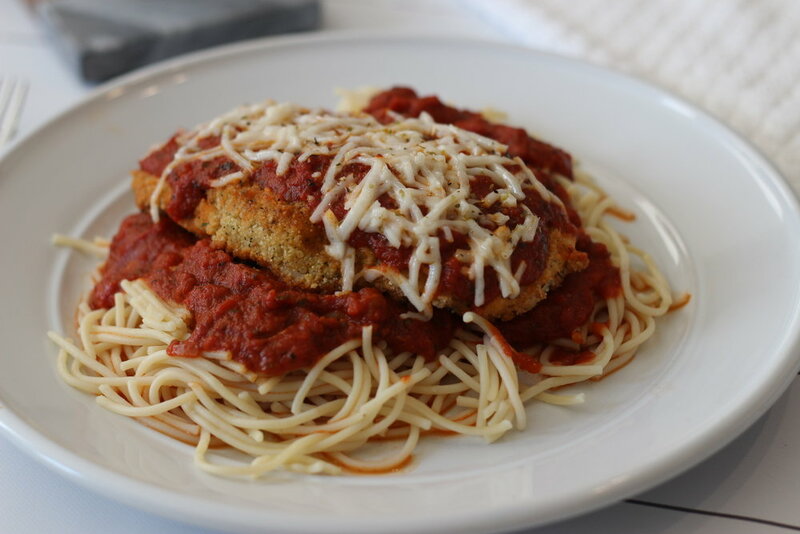 This chicken parm recipe is a take on the chicken parm my mom usually makes for my family, which uses regular bread crumbs and mozzarella cheese. In my recipe, I used gluten-free bread crumbs, and dairy-free mozzarella cheese. The best part? My non-gluten/dairy-free friends LOVED it and swore they didn't even notice a difference!! Serve pasta with sauce and optional parmesan cheese underneath or on the side of your chicken & enjoy!